Do you know why Fenugreek oil is one of a kind? It has a way of bringing back the lost glory all over the body. This oil will replenish you from the inside out. This healing oil does marvelous wonders. The benefits are countless – from healing breast conditions to hair care supplement and other ways it improves the general well-being with the prescribed doses. Processing of Fenugreek seed gives birth to the miraculous Fenugreek oil. As simple as it may appear, this oil has a plethora of benefits and a lot of nutritious values. You can treat almost any common health conditions with this oil and its seed. There are a variety of oil out there that are popular, but this one is more useful to the body. Unlike other cold-pressed oil, this one is an extract from seeds. Its contents are volatile organic compounds that are useful in aromatherapy. Through the process of steam distillation, the extract from its seeds turns to oil (Trigonella Foenum – Graecum). This seed can serve as a food ingredient as well as a natural medicine. The tomb of Tutankhamun has a large number of these seeds which has been in use since the olden days because of its numerous health benefits. A lot of ancient books said something meaningful about the health benefits of these seeds. Fenugreek Essential Oil: This variety has volatile compounds that are beneficial to health. Fenugreek Pressed Oil: This variety, on the other hand, has fatty acids that are also healthy in every way. The extraction process of this variety is the easiest of them all, as anyone can prepare theirs. Even in the comfort of your home. You can easily do this by infusing the seeds. This herb is common in the Mediterranean region, western Asia, and southern Europe where the weather is conducive for its growth. Some even use it to hide or quench the taste of medicine. The smell and taste of Fenugreek seeds are somewhat similar to maple syrup. India makes the most out of it because they even eat the leaves. The healing components of Fenugreek oil can cure and revive most health conditions. And here is a long list where this oil functional and of help. But don’t forget to consult a doctor before using it. People with acne pimples on their face or skin can use this oil to massage the affected spot. Just pour five drops of this oil in 5 ml of your base oil and let your hand do the massaging. It can also prevent swelling of the skin and even subside the pain. Repeating the above steps will keep those blackheads away from your face or skin. Since oxidation is the cause of blackheads, Fenugreek oil as an antioxidant prevents acne pimples from oxidizing. This oil gets rid of boils as well as other health conditions such as cysts, furuncles, ingrown hair, carbuncles, and folliculitis. To heal faster, you can pour a few drops of Fenugreek essential oil to the bandage covering the affected spot. As a home remedy, its presence hastens quick recovery. Environmental stress causes skin irritation. Many times, it could be due to some allergen or extreme weather conditions. You can mix a few drops of this oil with olive oil and rub it on your body. It reduces the pain and stops your skin from swelling. Fenugreek essential oil is good for massaging the body. Mixing Fenugreek with sweet almond oil during massage helps in soothing skin. It also relieves inflammation and improves skin performance. This natural oil is also a good option for soothing cough. All you need is to pour ten drops of this oil into a kettle of boiling water and inhale the steam. It is a cough medicine and as such helps the body to get rid of phlegm and any other productive cough such as bronchitis. Fenugreek oil ushers in a lot of therapeutic actions with the use of aromatherapy. With 4 – 5 drops of this oil in a diffuser, vaporizer, or an oil burner, its aroma will spread in the air. The savor of Fenugreek is a cure for high blood pressure as it influences and calms the nervous system. It stimulates sweating in a hot environment and can also relieve you of fever. Diabetic patients find this oil helpful. This natural oil improves the intolerance of glucose and lowers the level of blood glucose as well. It also prevents the beta cells from damaging and works as the pancreas stimulator. Another powerful health benefit of this oil is that it helps in stimulating insulin. You can mix 2 – 3 drops of Fenugreek oil with one spoon of Sesame oil and drink to your health. Seek doctor’s permission before start using it. This natural oil restores kidney conditions to normality. The use of this oil influences and protects the pancreas and the kidneys. But don’t forget to see a doctor before start using it. This natural oil has its unique taste in foods because it is also a spice for cooking. It is a flavoring agent that imitates maple syrup, beverages, food, and tobacco. It heals muscle pain, leg ulcers, eczema, and lymph nodes. Soaps and cosmetics manufacturers also use Fenugreek extracts in making their products. Do you know what? It doesn’t only have health benefits – there is also the side effect of using too much of this oil. Drinking this natural oil is the safest option for medicinal purposes – if you take the amount that should be in foods. But as you are busy drinking it daily, watch out for the side effects. And they are – stomach upset, diarrhea, bloating, gas, headache, as well as the odor of maple syrup in urine. It doesn’t just stop at those – there are other side-effects such as coughing, facial swelling, nasal congestion, wheezing, and allergic reactions. Consult with your doctor before using it. Consuming this oil in large quantity is unsafe in pregnancy. So don’t take much of it to avoid malformations in your baby and early contraction. Again consult with your doctor before using it. All parents should be aware that this oil is unsafe for children to take by mouth. Fenugreek tea causes unconsciousness in children. It also brings out an unusual odor that smells like maple syrup in children. If you are allergic to those plants in the Fabaceae family like peanuts, soya beans, and green peas, then Fenugreek is not for you. Don’t just assume that Fenugreek essential oil is the best thing that has come to pass in your life. It has prescribed doses for every health condition. Check with doctor for prescribed doses for any health issues. Using the extracts of Fenugreek seeds to maintain your hair is like wearing a glorious crown. Here is how you can use Methi seeds for your hair growth. Now that you know the content of Fenugreek seed oil. Using it for hair fall shouldn’t be a far-fetched notion. You should soak the seeds overnight, then blend them with a small quantity of lemon juice or water. Then apply it to the hair, and watch it wash off on its own. 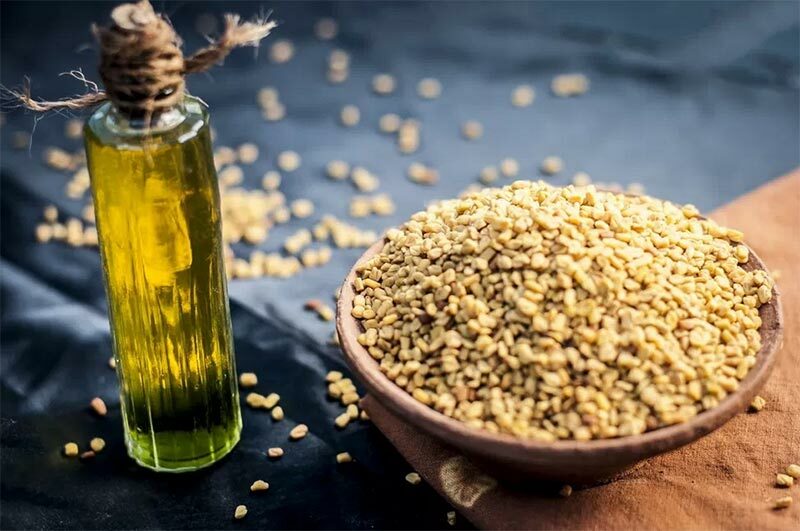 Fenugreek seed oil is the best option to get your hair back in shape. Just mix the seeds with coconut oil and boil until it turns red. Apply it on your scalp on a steady basis and let your jaw drop as you watch your hair grow. Soak the Fenugreek seed overnight, then mix it with cider vinegar afterward. Applying it on your hair and use a clear, mild shampoo to wash it off. This concoction helps in controlling excess oil on the scalp. The easiest way to cure a dry and itchy scalp is a mixture of Fenugreek seeds with egg yolk. Apply to the hair and let it last for 30 minutes, then wash with a mild shampoo. Dandruff can make someone sick but thank the stars for this miraculous Fenugreek seed oil. Combine it with yogurt and apply it on your hair for up to three times weekly. While washing it, do so with a mild shampoo. Soak the seeds with a glass of water and allow it to stay overnight. Then drink it the next morning and expect to see a luscious hair soon. There is this local way of preventing premature greys from taking over your hair space. Mix the seeds with curry leaves, apply to the hair and leave it for 30 minutes. Then wash with cold water and mild shampoo. This process works like magic. Fenugreek seed oil has a lot of amazing benefits and works wonders as well. It can reverse hair damages like frizz, split ends, and weak hair. Take a considerable amount of Fenugreek paste and mix it with coconut milk. Then apply to the hair and use a towel to cover your hair for up to 30 minutes. After this, wash with cold water and a mild shampoo. All you need is to soak about 10-15 grams of these seeds in water and allow it to stay that way overnight. When you wake up, grind it and apply to the hair. After 30 minutes, wash it with a mild shampoo and clean water. This process helps in conditioning the hair. Use Methi seeds and remove that frizz in a matter of time. Take 4-5 tablespoons of this seed powder and soak with water overnight. When you wake up in the morning, filter the sticky water and use it on your hair and leave it there for 10 minutes. Afterward, wash with water and let those curls of yours bounce back like the early morning dew. Fenugreek oil is a versatile herb that has all the exceptional benefits you will ever ask for in life. This oil is an all in one package. Since the discovery of this herbal medicine, it has cured a lot of health conditions. And will even do better in the future due to modern scientific research. Do you want to increase breast milk for your baby or to treat your hair? Fenugreek oil will do any of these. They say that tomorrow is always better than yesterday, so it is with this powerful medicinal plant.